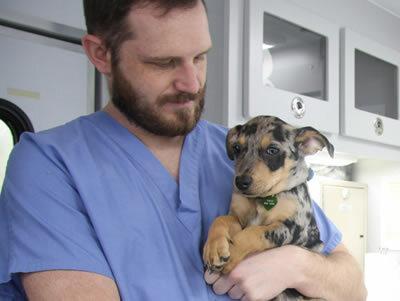 Three MU College of Veterinary Medicine Biomedical Sciences researchers are taking a “team science” approach to learn how obstructive sleep apnea leads to hypertension and whether that response can be mitigated through medical intervention. Eileen Hasser, PhD, and Cheryl Heesch, PhD, professors in the Department of Biomedical Sciences, and David Kline, PhD, an associate professor in the department, are partnering on a study funded by the Heart, Lung and Blood Institute within the National Institutes of Health. Hasser and Heesch both focus on integrative control of cardiorespiratory functions. In addition, Hasser’s lab is involved in extracellular recordings of single neurons in the brain; and Heesch uses laser capture microscopy to isolate particular cell types in the brain for further analysis of gene expression. The role of Kline’s lab is to provide detailed evaluation of neuron-to-neuron communications in isolated brain tissue. The NIH recently awarded a competitive renewal of the grant, which has been funded since 2009. The renewal, for $2,824,843, will underwrite the project from January 2016 through December 2019. The brain normally adjusts to hypoxia, or low oxygen levels, by activation of a reflex called the arterial chemoreflex. This normal response is why people breathe harder when traveling to high altitudes, which helps increase oxygen available to the tissues of the body. However, overactivity of the chemoreflex is associated with pathological conditions such as heart failure and hypertension. For example, individuals with obstructive sleep apnea become hypertensive. 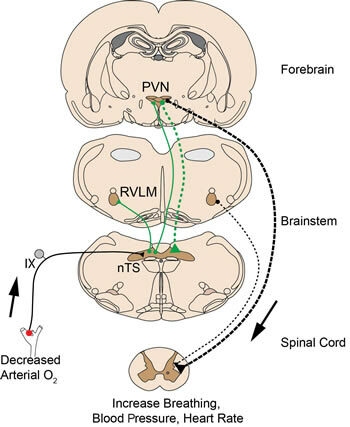 Using rat models, the researchers have identified some of the regions in the brain and the neural pathways connecting them that are responsible for the maladaptations in response to hypoxia. As shown in the schematic, those regions include two areas of the brain stem, the nucleus tractus solitarii (nTS) and the rostral ventrolateral medulla (RVLM), and one area of the forebrain, the paraventricular nucleus of the hypothalamus (PVN). The nTS is the region of the brain that receives sensory information from the body, including information from chemoreceptors on blood oxygen levels. This information is relayed to the RVLM, which is a major brain region for control of sympathetic nervous system activity and breathing. The PVN brain region also receives information from the nTS and is thought to contribute to the changes in cardiorespiratory function that are seen in disease. Their research so far has led these investigators to conclude that the PVN plays a larger role than previously believed in how the body normally responds to low oxygen. The next phase of the study will focus on the role of connections to and from the PVN during both brief (normal physiology) and longer term (pathophysiology) exposure to hypoxia. Identifying CNS transmitters and receptors that are involved in these processes, could lead to potential therapies for treating diseases such as obstructive sleep apnea.